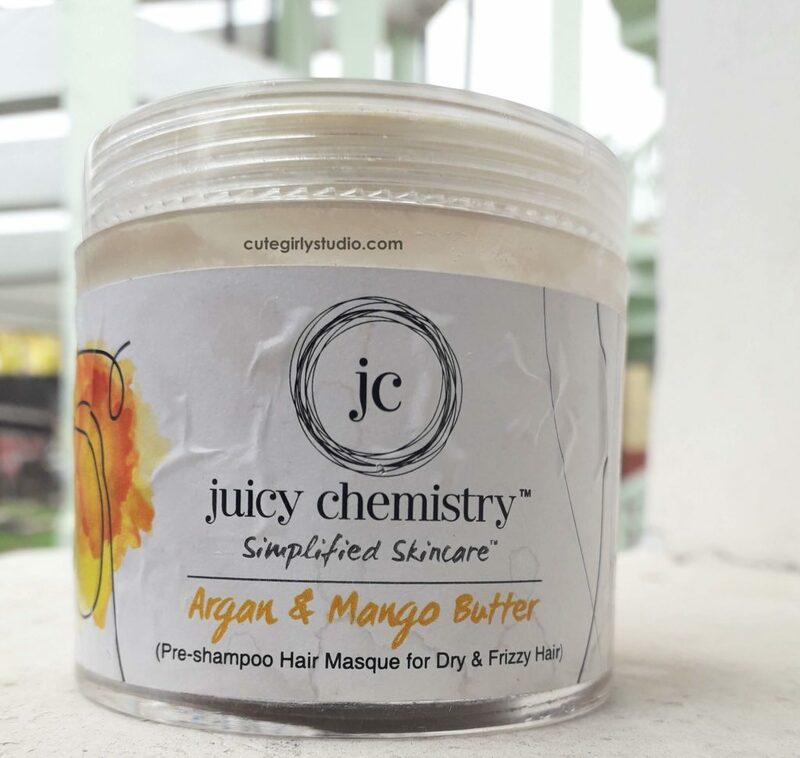 I have been using Juicy chemistry products for a while now and I have already reviewed their anti acne serum and leave in hair conditioner on my blog already. You can have a look at them here and here. 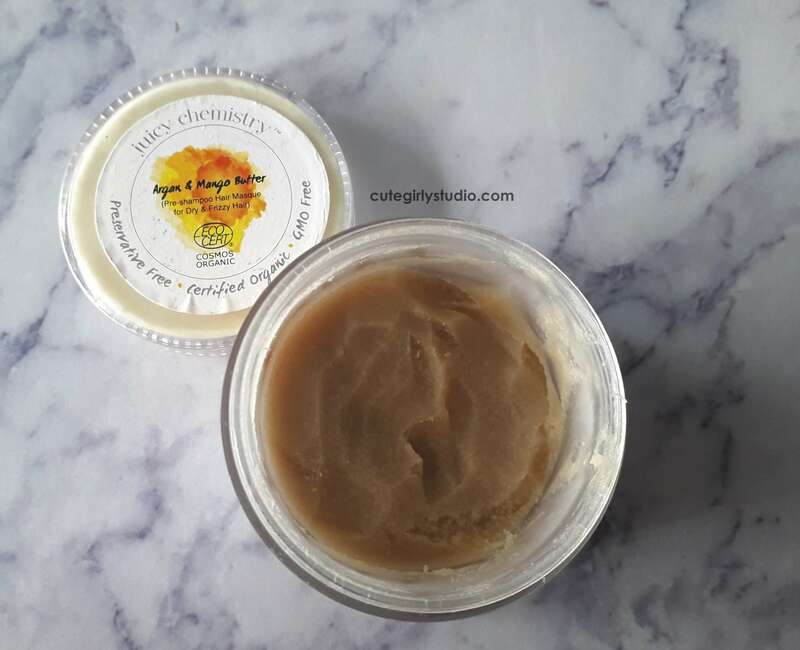 Today I’m gonna review one of the most popular product of their brand that is none other than Juicy chemistry Argan and Mango butter hair masque. I have read several positive reviews for this particular product and those reviews made me try out this product and here are my views. 850 INR for 75gm . You can buy the hair mask here. Butyrospermun Parkii (Shea Butter), Mangifera indica (Mango Butter), Argania Spinosa (Argan Oil), Coffee Bean Infused Almond Oil, Tocopherol (Natural Vitamin-E), Prunus Dulcis (Sweet Almond Oil), Simmondsia Chinensis (Jojoba Oil), Ricinus Communis (Castor Oil), Beeswax, Cedrus Atlanticus (Cedarwood Oil), Lavandula Angustifolia (Lavender Essential Oil), Rosmarinus Officinalis (Rosemary Essential Oil), Mentha Spicata (Peppermint Essential Oil), Matricaria Recutita (German Chamomile Essential Oil) . I have oily scalp and dry hair. I always look for moisturizing hair products since I have wavy dry hair which demands hydration and moisturization. Since I have read that it tames frizzy hair and deeply moisturises the hair ends, I had great expectation upon this hair masque. The juicy chemistry argan and mango butter hair masque is light brown in colour and has a soothing aroma. It has shea butter, mango butter which has the property to moisturize our dry hair. Also argan oil which is the start ingredient of this hair mask helps to repair damaged hair. Coffee in hair care helps to hydrate the hair. This hair masque has ingredients that nourish the dry hair. I take tiny amount of this hair mask and warm it between my palms and apply it all over my scalp and hair lengths concentrating at the ends. Then I leave for about 30 minutes as mentioned by the brand. Then I wash my hair with SLS free shampoo. It takes 2 washes to remove the oiliness. I always feel as if my hair is greasy until my hair is completely dry. I didn’t feel any reduction in frizziness nor the texture. My hair feels moisturized but not smooth . It leaves my hair smell like a garden of flowers. I just love how my hair smells post shampooing. Overall this hair mask does decent job of what a concoction of butters and oils will do. This hair mask claims to promote hair growth and I’m using this hair mask for more than 3.5 months and I didn’t see any difference in my hair density or length. This hair mask gives a spa like experience and moisturises your hair well. If you are looking for a hair care to give a spa like experience then you can give this a try. Nope, Hot oil treatment with extra virgin olive oil or coconut oil leaves my hair smooth and tames my frizzy hair. If you have tried this hair mask before, share your take on this argan and mango butter hair masque in the comments.